Nestling in the Dorset countryside on the edge of Bridport, sheet metal subcontractor Ackerman Engineering’s freehold 1500 sq m factory was purpose-built in 2006 by current managing director, Graham Ackerman, great-grandson of the company’s founder, William, who started the enterprise in 1885. Indeed, 2006 was a seminal year that saw the purchase of a Bystronic BySpeed 4.4 kW CO2 laser-cutting machine, another press brake from the same supplier and a generation facility for nitrogen. Nitrogen is the assist gas of choice when laser cutting as it produces a non-oxidised edge for painting without the need for fettling. In addition, nitrogen allows cutting speeds up to three times faster in thin to mid-range gauges. CO2 laser technology, which had been used by the company since 2001, was phased out in August 2018 when the 4.4 kW machine was part-exchanged for a ByStar Fiber 8 kW fibre laser-cutting centre, which joined a 3 kW BySprint Fiber installed four years earlier. Both are of 3 m x 1.5 m sheet capacity. At the same time, an Xpert 150-tonne, 3.1 m press brake was added to the six Bystronic models already on-site, one of which dates back to 2001 and is badged Edwards Pearson, which the Swiss manufacturer acquired in 2002. The advantage of profiling and bending components on the same make of equipment is that Bystronic’s offline Bysoft 7 software modules, ‘Laser’ and ‘Bend’, work together to produce precise 3D sheet-metal parts. Graham Ackerman says that drawing tolerances are almost incidental, as they are routinely held due to the accuracy of machining. 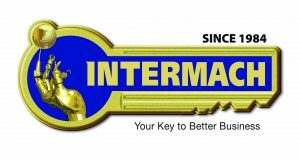 Inspection is scarcely needed, as quality is virtually guaranteed once a job is in production. Any mistakes are almost always down to human error, so most of inspection effort is at the CADCAM stage. A customer’s drawing or model, which usually arrives in DXF, DWG, IGES or STEP format, is interrogated in the subcontractor’s CAD department to ensure the component’s manufacturability. 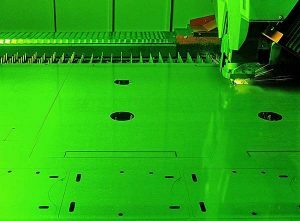 The file is then exported as a flat blank to the Bysoft CAM environment, where the programs for fibre-laser profiling and bending are generated automatically. He adds that the Bridport factory mainly processes aluminium, stainless steel and mild steel sheet from 0.7 to 8 mm thick, with a lot of material in the 1.2 to 2 mm range for the manufacture of electrical cabinets. When cutting these gauges, the 3 kW fibre machine is typically two to three times faster than CO2. However, when the 8 kW fibre laser was installed, a further increase in throughput was seen, as processing times are less than half those using the 3 kW fibre source. 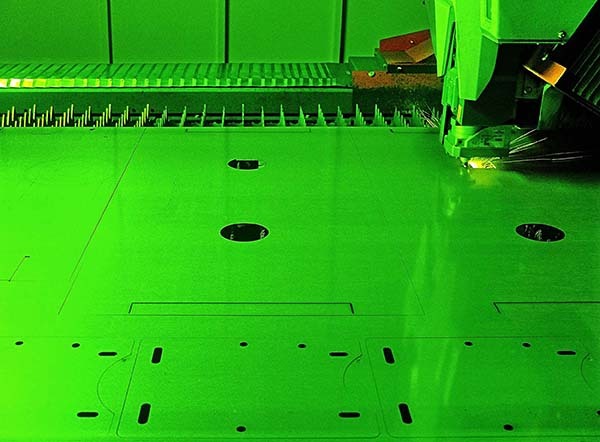 Additionally, CO2 machines require a 15-minute warm-up in the morning and a similar time to close down at the end of the day, whereas these unproductive periods are avoided with fibre-laser cutting. Another benefit of the technology is its low running costs. No laser resonator gas is needed, while an even greater saving derives from reduced electricity use. Ackerman notes that the firm’s larger fibre source draws less than half the power of the previous CO2 machine, yet delivers nearly twice the power to the point of cutting. The wasted energy previously had to go somewhere, which was into the factory in the form of heat, so the fibre-only working environment was more pleasant during the summer months. Appraising his company’s use of fibre-laser cutting, Ackerman made a couple of interesting observations. One was that the 8 kW machine is so fast that the expected increase in nitrogen usage did not materialise due to the short cycle times, so it has not been necessary to increase the size of the gas generation plant. too strong for cutting 0.8 or 1.2 mm material, a problem that is easily overcome by turning down the power of the source. 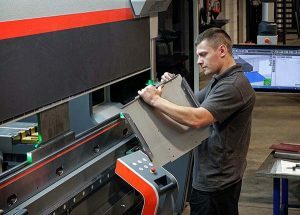 To maximise productivity, however, the lower power fibre machine is designated to cut thinner gauges, while the 8 kW laser cutting centre is kept on full power for processing thicker materials. 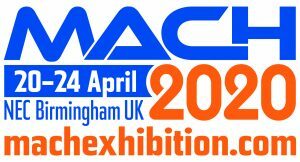 It is due to these relatively low batch sizes that Ackerman Engineering has restricted its automation equipment to simple ByLoaders for feeding the fibre-laser machines with material. The step up to a ByTrans automated sheet loading/unloading arrangement would have not lent itself to such small runs. In any case, it would have necessitated tagging components within the sheet, then shaking them out and de-pipping them, which is not conducive to the premium-quality work for which the subcontractor is known. Modern press braking technology has been a similar boon to the firm’s business. 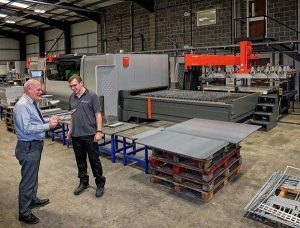 Ackerman is particularly impressed with the latest Bystronic Xpert 150, for which he has bought a comprehensive suite of the manufacturer’s RF-A segmented tooling. He says it is twice as fast to set up compared with older style tooling, as the punch and die segments are automatically centred when loaded from the front and hydraulically clamped. Moreover, the system is fully compatible with the Bystronic bending database in the machine control, and it is practically impossible to insert an incorrect tool due to laser beam recognition of its profile. Part quality is improved, especially when bending long components, as there are no witness marks where the tool segments meet, and there is no need to resort to shimming. When Ackerman joined the family firm in 1979 at the age of 17, the only other employees were his father, David, together with three or four other staff. From the early 1970s using a treadle guillotine, self-made power press tools and an Edwards box and pan folder, David started producing light sheet-metal fabrications. The company had nearly reached its century but had not realised much in the way of progress. Ackerman Engineering had, however, reinvented itself a number of times, from its beginnings in watch and clock manufacture, to automation of Bridport’s netting looms in the 1950s and 1960s. “Once sheet metalworking became our activity of choice, the foundations of sustained growth ensued. Today we have 34 staff working in Bridport, including a fifth generation Ackerman, my son Edward.